For Israeli audiences, this scenario may sound horrifyingly familiar. A young man is kidnapped and brutally tortured. Except this didn’t happen this summer, but eight years ago – and in Paris. The victim was Ilan Halimi, a 23-year-old Parisian Jew whose murder has come to symbolize the rise of anti-Semitism in modern-day France. January 20, 2006. After dinner with his family, Ilan Halimi called an attractive girl he had met at work and made plans to meet her for coffee. Ilan did not suspect a thing; he was 23 and had his whole life ahead of him. The next time Ilan’s family heard from him, it was through a cryptic online message from kidnappers demanding a ransom in exchange for their son’s life…. French director Alexandre Arcady delivers one of the most “wrenching and politically astute” films to come out of France over the past year (Screen Daily). 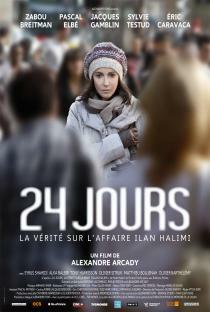 Based on a book co-written by the victim’s mother, Ruth Halimi, Arcady’s cinematic adaptation offers a vicious circle of dangerously realistic events: from the kidnapping and torture of Ilan Halimi at the hands of the Gang of Barbarians, to the the 600-plus phone calls, insults, and threats received by the family, though the Parisian police’s incompetence in dealing with what was clearly an anti-Semitic crime.